Traders had trouble figuring out what was going on in markets early Friday after Bloomberg terminals crashed for several hours. When service was restored, the screens quickly turned red with European markets and U.S. futures tumbling. 1. Bloomberg outage: Bloomberg terminals around the world went down this morning, affecting a significant part of the company's network. Most service was restored by soon after 7 a.m. ET. Bloomberg has more than 300,000 terminals globally. 2. 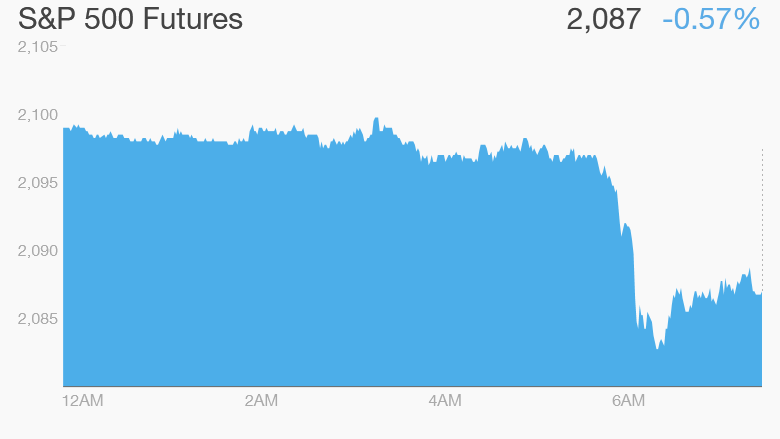 Futures down: U.S. stock futures were down in early trading on Friday. The Dow Jones industrial average was down by 0.6%. The S&P 500 slipped 0.7% and the Nasdaq dropped 0.9%. 3. Stock market movers -- Mattel, Schlumberger, Netflix: Mattel (MAT) was up 6% premarket following its latest quarterly earnings. Although revenue fell from a year ago and the company posted a loss, sales topped forecasts and the loss wasn't as big as expected. Shares of Schlumberger (SLB) also rose in extended trading after the oil services company said it was laying off another 11,000 workers. The stock was edging up 2% premarket. Netflix (NFLX) climbed 1% premarket after showing strong subscriber growth earlier this week. Worth over $500 a share, Netflix is the best performer by far in the S&P 500 this year, with analysts expecting further growth. 4. Earnings and economics: General Electric (GE) and Honeywell (HON) are reporting ahead of the open. The Bureau of Labor Statistics will report on the CPI at 8:30 a.m. ET. Unemployment in U.K. fell to 5.6% in February, the lowest since 2008. Jobs are a big topic ahead of the general election next month. 5. International markets overview: The Greek drama was once again worrying markets. European markets were down in morning trading. Germany's Dax lost 1.9% and the FTSE 100 was down 0.8%. German Finance Minister Wolfgang Schaeuble said he doubted a deal between Greece and its creditors could be reached next week. Greek bond yields climbed further. Asian markets ended the week mixed. China's Shanghai Composite climbed 2.2%, while the Nikkei ended the session 1.17% down. 6. Thursday market recap: The Dow Jones industrial average fell by 7 points, while the S&P 500 slipped 0.08% and the Nasdaq edged 0.06% lower.